When I am grocery shopping I am always down for trying something new and different. About a month or so ago, I saw these Chili's Skillet Sauces. -Cut the chicken up in cube or wide strips (I did strips). -Brown the chicken in a skillet, place cooked pieces to the side on a plate. -Once all pieces are cooked, add sauce and cook for 2-3 minutes. -Add salt and pepper and stir. 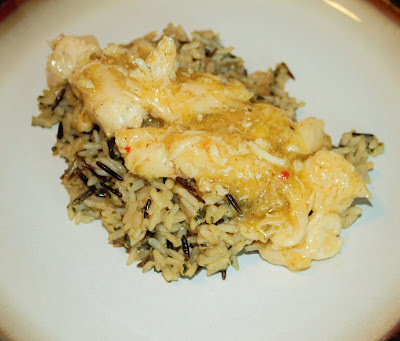 -Place sauce on top of wild rice. I ended it placing my chicken on top of some wild and long rice. The sauce can be used for tacos, fajitas, or even alone with just the chicken. Overall, once I added the pepper and salt it made it taste better. I do have to say that the flavor of the rice and sauce were really good. I would recommend eating this over rice instead of by itself. The sauce is a little sweet with just it and the chicken. This is my own personal opinion of the product.